Tucked away just outside of Sonoma California, in the heart of the Sonoma Valley wine district, lies an elegant and gracious hostelry -The Sonoma Mission Inn and Spa. The resort, managed by the Fairmount Hotel Corporation, retains its classic California-style insouciance while pampering its guests with the most modern spa treatments and facilities. Luxurious, but not stuffy, the Sonoma Mission Inn offers guests one-of-a-kind, comfortable accommodations, many with wood-burning fireplaces and private verandahs or balconies that overlook fields of northern California grape vines. High-speed Internet access in all of the guest rooms and a 24-hour business center help guests keep in touch while enjoying the carefree setting. Complimentary wine tasting in the lobby each afternoon allows guests to share their experiences exploring the Sonoma Valley. 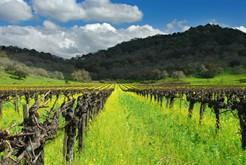 The surrounding vineyards and rolling, golden hills provide a romantic backdrop to any day's activities. The Sonoma Mission Inn and Spa is built on a source of natural thermal mineral water and the resort's spa makes good use of it, with a thermal pool and spacious bathhouse. Guests are pamperedr with a full menu of services, including over a dozen different kinds of massages, such as the Native-American inspired Sonoma Stone treatment as well as several herbal wraps, and a Sonoma lavender facial. Other Spa treatments range from a traditional facial or massage to a hot stone massage and a Hungarian Moor Mud Kur, a detoxifying massage using mud infused with rosemary and healing waters. The spa complex includes a state-of-the-art fitness facility that sports all of the latest work-out equipment, TVs with personal headsets, and a variety of classes, including yoga, pilates, water yoga and Ai Chi. Hotel guests receive a discount on spa services and the resort offers many multi-treatment packages. In addition to the spa, the resort features a classic 18-hole championship golf course, designed in 1928 by golf architect Sam Whiting, a secluded, Olympic-size outdoor swimming pool, and miles of hiking and biking trails. The resort will even map out a special biking route for guests and provide bikes and a picnic lunch. The hotel's fine-dining restaurant, "Sante," creates delicious spa cuisine as well as a full menu of California favorites, featuring the Sonoma Valley produce and Northern California wines. The "Big 3" Restaurant offers California bistro-style breakfasts and lunches, just as it has for over 50 years. The "Water Tower" is the resort's poolside eatery. Located next to the resort's historic water tower, the restaurant serves a variety of salads and light entrees in a casual setting. In addition to high-speed Internet access, business guests will appreciate the 24-hour business center, equipped with fax and copy machines, a/v equipment, conference calling, and on-call secretarial services. The Sonoma Mission Inn also offers ten elegant meeting rooms, which can accommodate up to 2000 guests for business conferences, trade shows, or wedding receptions. The Sonoma Mission Inn makes an ideal base for exploring the Sonoma Valley countryside and its wineries, antique shops, and wide-open spaces. It's also a great place just to relax and enjoy the legendary Northern California hospitality.